Immunofluorescence is a technique used for light microscopy with a fluorescence microscope and is used primarily on microbiological samples. This technique uses the specificity of antibodies to their antigen to target fluorescent dyes to specific biomolecule targets within a cell, and therefore allows visualisation of the distribution of the target molecule through the sample. Immunofluorescence is a widely used example of immunostaining and is a specific example of immunohistochemistry that makes use of fluorophores to visualise the location of the antibodies. Immunofluorescence can be used on tissue sections, cultured cell lines, or individual cells, and may be used to analyze the distribution of proteins, glycans, and small biological and non-biological molecules. Immunofluoresence can be used in combination with other, non-antibody methods of fluorescent staining, for example, use of DAPI to label DNA. Several microscope designs can be used for analysis of immunofluorescence samples; the simplest is the epifluorescence microscope, and the confocal microscope is also widely used. Various super-resolution microscope designs that are capable of much higher resolution can also be used. Primary, or direct, immunofluorescence uses a single, primary antibody, chemically linked to a fluorophore. The primary antibody recognizes the target molecule (antigen) and binds to a specific region called the epitope. The attached fluorophore can be detected via fluorescent microscopy, which, depending on the messenger used, will emit a specific wavelength of light once excited. Direct Immunofluorescence, although somewhat less common, has notable advantages over the secondary (indirect) procedure. The direct attachment of the messenger to the antibody reduces the number of steps in the procedure, saving time and reducing non-specific background signal. This also limits the possibility of antibody cross-reactivity and possible mistakes throughout the process. 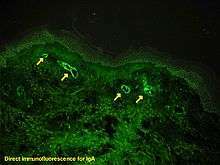 However, since the number of fluorescent molecules that can be bound to the primary antibody is limited, direct immunofluorescence is substantially less sensitive than indirect immunofluorescence and may result in false negatives. Direct immunofluorescence also requires the use of much more primary antibody, which is extremely expensive, sometimes running up to $400.00/mL. 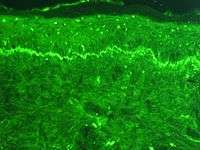 Secondary, or indirect, immunofluorescence uses two antibodies; the unlabeled first (primary) antibody specifically binds the target molecule, and the secondary antibody, which carries the fluorophore, recognises the primary antibody and binds to it. Multiple secondary antibodies can bind a single primary antibody. This provides signal amplification by increasing the number of fluorophore molecules per antigen. This protocol is more complex and time-consuming than the primary (or direct) protocol above, but allows more flexibility because a variety of different secondary antibodies and detection techniques can be used for a given primary antibody. As with most fluorescence techniques, a significant problem with immunofluorescence is photobleaching. Loss of activity caused by photobleaching can be controlled by reducing the intensity or time-span of light exposure, by increasing the concentration of fluorophores, or by employing more robust fluorophores that are less prone to bleaching (e.g., Alexa Fluors, Seta Fluors, or DyLight Fluors). Immunofluorescence is only limited to fixed (i.e., dead) cells when structures within the cell are to be visualized because antibodies cannot cross the cell membrane. Proteins in the supernatant or on the outside of the cell membrane can be bound by the antibodies; this allows for living cells to be stained. Depending on the fixative that is being used, proteins of interest might become cross-linked and this could result in either false positive or false negative signals due to non-specific binding. An alternative approach is using recombinant proteins containing fluorescent protein domains, e.g., green fluorescent protein (GFP). Use of such "tagged" proteins allows determination of their localization in live cells. Even though this seems to be an elegant alternative to immunofluorescence, the cells have to be transfected or transduced with the GFP-tag, and as a consequence they become at least S1 or above organisms that require stricter security standards in a laboratory. 1 2 3 Fritschy, Jean-Marc; Härtig, Wolfgang (2001). 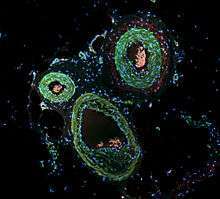 "Immunofluorescence". ELS. doi:10.1038/npg.els.0001174. ISBN 047001590X.